It's no secret that getting autonomous vehicles on public roads isn't easy. Philipp oversees product development, testing and project management across Silicon Valley, Europe and China. The road to autonomous vehicles has not been easy. There have been (and will continue to be) a few bumps along the way. What used to be science fiction is now close to becoming a reality—autonomous vehicles. It’s no secret; getting autonomous vehicles on public roads is pushing AI technology beyond its limits. That’s because, in an ideal scenario, driverless cars can improve many areas of public transportation, grant more autonomy to impaired people, and lessen the impact of carbon emissions. Uber, Tesla, and Google have already begun testing driverless cars on public roads for a while now. However, there’s still a long way to go until the average Joe will be able to give up on the classic means of transportation and rely on driverless vehicles to perform daily duties. There are just a few obstacles that still need to be overcome. Our cities have not been designed to accommodate self-driving cars. Currently, neither do transportation policies and public administration protocols. That’s why legislation must play a bit of catch-up after the technology is fully developed. For example, whenever new technology enters the marketplace, lawmakers tend to over-regulate it, in fear of another social media free for all. On the flipside, lawmakers might wait for self-driving big players to develop self-regulation first—become their own industry watchdog. Another challenge that policymakers will face is the liability. For criminal and civil purposes, they will have to define what “driver” means and where to charge responsibility in case of vehicle malfunction, accident or theft. Take carjacking as an example. Upon complete testing of cybersecurity technology, lawmakers will have to deal with a new form of carjacking called “car-hacking.” How do you charge someone for stealing a car when they never stepped one foot in it? Is it felony vehicle theft or a class B misdemeanor for hacking a website? Also, what role will auto insurance companies play in all this? Are drivers ready to welcome the change? Many drivers claim they find it comforting to sit at the steering wheel and feel the vehicle respond to their commands. So, the question remains: Are we ready to accept the loss of control? In a study on Psychological roadblocks to the adoption of self-driving vehicles, researchers Azim Shariff, Jean-Francois Bonnefon, and Iyad Rahwan suggest that individual users will have to overcome a suite of mental models in order to fully be comfortable onboard a self-piloted vehicle. Until we figure out our biases, carmakers are surely betting their all on autonomous vehicles — in a race towards being at the forefront of a massive switch in the way people approach mobility. Top Automakers’ Predictions – When Could the “When” Occur? 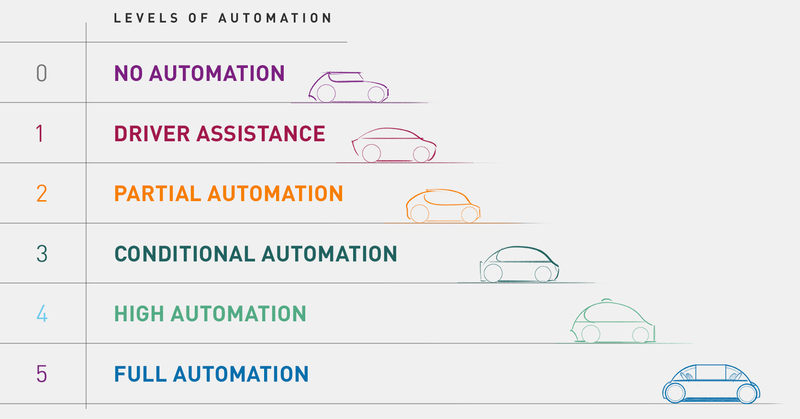 When it comes to fully automated cars, we're already seeing a switch from “if” to “when” they will happen. All carmakers’ efforts are put into hastening the process of launching self-driving vehicles commercially. After all, their main interest is to start making money off their humongous investments. But how exactly are the big players planning to address driverless tech growth? In their ambition to become “the first high-volume auto manufacturer to build fully autonomous vehicles in a mass-production assembly plant,” GM is currently striving to challenge Uber and Lyft’s services by developing its own ride-sharing division called Maven. Although there is no official timeline for GM, their next step seems to be the deployment of test fleets in 2018, in what appears to be the largest test effort by any other carmaker so far. The massive investment in robotics company Argo AI at the beginning of the year is a clear sign Ford is committed to their plan of having a fully automated vehicle built by 2021. Ford’s former CEO Mark Fields had said that Ford is striving to reach Level 4 automation in its self-driving vehicles. This means no pedal, no steering wheel and no passenger control within predefined areas. Pushing the envelope, as usual, Tesla seems to be ahead of the game if we were to stick by Elon Musk’s ambitions of having a car drive completely on enhanced autopilot from Los Angeles to New York in 2018. As daring as this claim was, it appears that the company is still trying to perfect its Enhanced Autopilot feature, which justifies the lack of updates during the last months. As Uber’s provider, Volvo has already taken important steps like accepting full liability for any prospective incident on the road. Liabilities aside, they are building towards a fully independent car to hit the highways in 2021 and towards premium vehicles at costs within the $10,000 range. Overall, the consensus seems to favor the 2020’s as the time to expect autonomous cars on the roads and in the 2030’s as the time driverless rides will hit the highways. As expected, the forecast for vehicles’ integration within the urban infrastructure is not so optimistic since we cannot predict the pace legislation will pass. Telenav has also been busy during this disruptive phase. In fact, several Telenav navigation and mapping products are leveraged by carmakers for the autonomous car space. Our Self-Parking feature will be the first big step towards autonomous driving. Our Auto Cruise technology will make the highway autonomous ready by enabling certain sectors of the highway for hands-free driving. Also, Telenav’s Augmented Reality capabilities can enable driver assistance in safe lane changes, upcoming turns, parking assistance, and more.